The Otto G. Richter Library on the Coral Gables campus is the central interdisciplinary library for the University of Miami. The Richter Library opened in 1962 with gifts from the estates of Otto G. Richter and Meyer Gold, and from the George A. Brockway Foundation. The Richter Library is one of six UM Libraries whose collective mission is to provide UM faculty, students, researchers, and staff with the highest quality access to collections, information services, learning support, and digital expertise in support of the University’s mission to transform lives. Richter Library provides the university community with dynamic and technologically-rich services and facilities, including a Creative Studio, Learning Commons, Digital Scholarship support, and comprehensive Research and Access support for study in the arts and humanities, social sciences, STEM, and multidisciplinary/interdisciplinary fields. 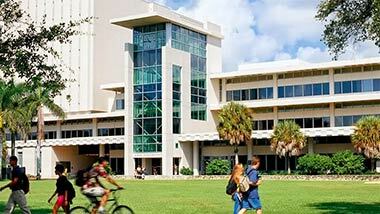 Richter Library is also the location of three of the University of Miami Libraries distinctive Collections programs. The Cuban Heritage Collection is found on the second floor. The Kislak Center, home to Special Collections and University Archives is found on the first floor. The Richter Library’s Digital Production Lab provides state of the art digitization for the Libraries and the Conservation Lab ensures that the Libraries extensive collection of unique and rare material on paper is preserved for long-term access. The Richter Library is also home to UM Libraries operations supporting the acquisition, cataloging, discovery and online use of the Libraries’ print and online information resources. Otto G. Richter was a successful accountant from Pittsburgh, Pennsylvania. At the age of forty-five, Richter retired and moved to Miami where he became involved in various organizations as a philanthropist. Richter was one of the original members of UM’s Citizens Board. In 1951, Richter established a “Loan and Scholarship Fund” for the University. By the end of the decade, his giving history to the University totaled more than $100,000. In 1959, Richter left his entire estate to the University of Miami, a major portion of which was used to finance the construction of a long-awaited central library. The University Trustees named the library in Richter’s honor and President Jay F.W. Pearson dedicated the building on June 10, 1962.